Mission focus is why we justly admire our active-duty and Veteran military personnel. Unfortunately for our service members and Veterans, “Playing with pain” can quickly evolve from a mantra to a way of life. This means that injuries and ailments are pushed aside, even if non-prescription painkillers are required. To protect yourself and your loved ones, before leaving service, all active-duty military personnel should make it their mission to take this one crucial step, preferably in the year before they separate. Here’s the step: a pre-discharge physical. WHY INSIST ON A PRE-DISCHARGE PHYSICAL? Military service loads the miles on your body. A pre-discharge physical establishes a health baseline. Done properly, you are accurately recording those health issues generated as a result of your military service. As the saying goes, “Don’t cheat the government and don’t cheat yourself.” That’s what a pre-discharge physical is for: to make sure all service-connected ailments are documented as such. What a lot of people miss is that the knee bone is connected to the hip bone, so to speak. You may have injured your ankle and therefore focus on the ankle pain. But, you might not appreciate that the ankle pain causes you to favor your other leg, to misalign the rest of your body, or to stop exercising, or to take painkillers. The misalignment, weight gain, bloating and the like are the results of the initial injury. It’s the connection between the underlying injury and the injury induced additional health issues that many sufferers fail to understand. The pre-discharge physical gives you data that may not mean a lot to you right now but is crucial years later in assessing and establishing the service-connection of your ailments. As soon as you plan to separate, retire, or anticipate release from active service, make sure you insist on a physical examination. Be clear about all medical issues you believe are service-connected. Definitely raise all health issues which are bothering you. 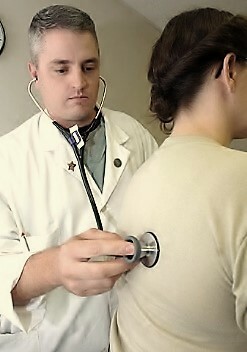 Insist that all diagnoses be placed in your service medical notes. Follow-up on all examinations (don’t miss any). When you complete your “Report of Medical History,” [DD Form 2807-1, effective March 2015, expiring on October 31, 2017] make sure you indicate EVERYTHING that is affecting your health. Especially important is noting when the health issues arose during your military service. The reason: you want to be clear that you didn’t have those health issues prior to your military service. Memories fade over time, so consider DD Form 2807-1 the health diary to which you will refer throughout your life. SUBMIT YOUR DISABILITY CLAIM PRIOR TO SEPARATION! Here’s a secret no one shares much. Although the Department of Veterans Affairs (VA) is notoriously slow at processing Veterans’ disability claims, they tend to work a bit faster on claims which are submitted pre-discharge. VA admits this much itself. You are entitled to file your claim for VA disability compensation up to 180 days prior to your separation or retirement from active duty or full-time National Guard or Reserve duty! VA offers a Benefits Delivery at Discharge (BDD) if you are more than 60 days from separation and a Quick Start claim if you are fewer than 60 days from separation. There’s always a catch, as you know by now. You can’t have an attorney represent you when you file a pre-discharge claim. While that fact should not stop you from filing, you should keep in mind that you likely will not receive all the benefits to which you are entitled. Therefore, even if you receive disability benefits via VA’s pre-discharge benefits submission process, it is a wise idea to consult with an attorney to ensure you are receiving everything to which your military service entitles you. HOW ARE DISABILITY BENEFITS LIKE INSURANCE? If you can use benefits received now as a type of built-in savings plan, the monetary value will be there when you need it the most. VA does not “store” disability benefits for you. Let’s say your service-connected ankle injury results in terrible back-pain issues that require surgery when you’re in your fifties. If you wait until you’re in your fifties to file for disability benefits, guess what? First, it will take forever to have your claim processed. Second, VA will express bureaucratic incredulity at the claim that your back issues have a service connection. And third, if you do receive benefits, they only start from the day you filed your claim. VA does not store them up back to the day you left the military. Not at all. So, instead of having an insurance policy that could have helped you and your family weather some of the financial storm created by your service-connected disability, you will only receive assistance going forward. WHY CHECK WITH AN ATTORNEY? Even if you prudently filed your disability claims before leaving service, you probably didn’t receive all the benefits to which you are entitled. A VA-accredited attorney can review your file, discuss your service, assess the situation, and determine if you are eligible for additional disability benefits. As we’ve mentioned in previous articles, many Veterans do not fully appreciate that many of their current ailments have a direct service connection. VA relies on that lack of knowledge in its review of claims. Many diseases, conditions, and ailments are too easily swept under the carpet of “the normal aging process” when, in fact, they are not. Service-connected injuries can have a cumulative effect over the years. This explains why some Veterans may feel a lot older than their civilian contemporaries. As the character Indiana Jones famously remarked, “It’s not the years, honey, it’s the mileage.” You’re not feeling old because you’re old. You’re feeling old because of the wear-and-tear active-duty military service puts on the human body. If you know someone on active-duty, urge them to get a pre-discharge physical and file for disability benefits if they believe they have a service-connected injury. When treated like an insurance policy, disability benefits can help Veterans and their families get through economic tough times caused by the Veteran’s service-connected disabling condition. Any claim requiring VA action should be filed immediately. The good news is, by taking prompt, early action, you are in the best position to maintain or improve your benefits situation. DON’T WAIT. Contact the Law Office of Robert B. Goss, P.C. today to a FREE consultation.